David Robert Jones (8 January 1947 – 10 January 2016), known as David Bowie, was an English singer, songwriter, multi-instrumentalist, record producer, painter, and actor. He was a figure in rock music for over five decades, and was considered by critics and musicians as an innovator, particularly for his work in the 1970s. His career was marked by reinvention and visual presentation, and his music and stagecraft significantly impacted popular music. During his lifetime, he sold an estimated 140 million records worldwide. In the UK, he was awarded nine platinum album certifications, eleven gold and eight silver, and in the US received five platinum and seven gold certifications. In 1996 he was inducted into the Rock and Roll Hall of Fame. Bowie embarked on a professional career as a musician in 1963. “Space Oddity” became his first top five entry on the UK Singles Chart after its release in July 1969. After a period of experimentation, and after making brilliant albums as The Man Who Sold the World (1970) and Hunky Dory (1971), he re-emerged in 1972 during the glam rock era with his flamboyant and androgynous alter ego Ziggy Stardust. 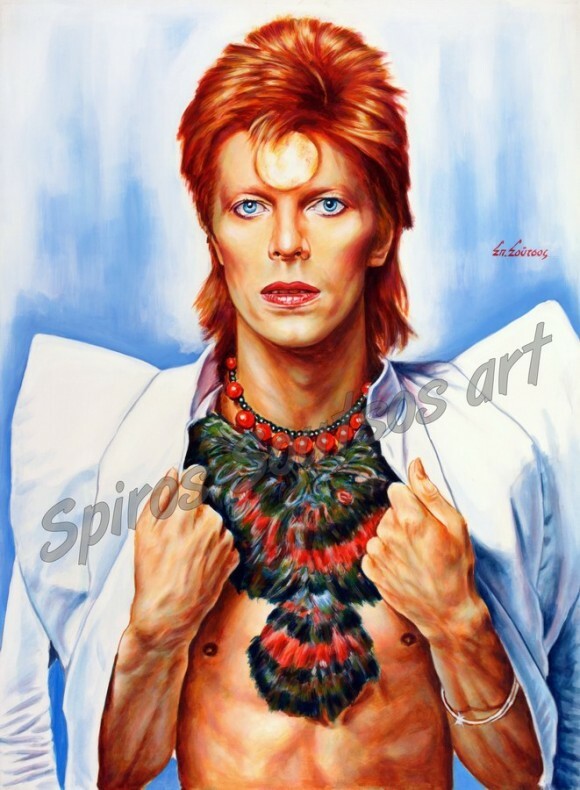 The character was spearheaded by the success of his single “Starman” and album The Rise and Fall of Ziggy Stardust and the Spiders from Mars (1972) and won him widespread popularity. In 1975, Bowie’s style shifted radically toward a sound he characterised as “plastic soul”, initially alienating many of his UK devotees but garnering him his first major US crossover success with the number-one single “Fame” and the album Young Americans. In 1976, Bowie began a sporadic acting career, starring in the cult film The Man Who Fell to Earth. The following year, he further confounded musical expectations with the electronic-inflected album Low (1977), the first of three collaborations with Brian Eno that would come to be known as the “Berlin Trilogy”. “Heroes“ (1977) and Lodger (1979) followed; each album reached the UK top five and received lasting critical praise. After uneven commercial success in the late 1970s, Bowie had UK number ones with the 1980 single “Ashes to Ashes”, its parent album Scary Monsters (And Super Creeps), and “Under Pressure”, a 1981 collaboration with Queen. In March 1982, the month before Paul Schrader’s film Cat People came out, Bowie’s title song, “Cat People (Putting Out Fire)“, was released as a single, becoming a minor US hit and entering the UK top 30. He then reached a new commercial peak in 1983 with Let’s Dance, with its title track topping both UK and US charts. Throughout the 1990s and 2000s, Bowie continued to experiment with musical styles, including industrial and jungle. Bowie also continued acting; his roles included Major Celliers in Merry Christmas, Mr. Lawrence (1983), the Goblin King Jareth in Labyrinth (1986), Pontius Pilate in The Last Temptation of Christ (1988), and Nikola Tesla in The Prestige (2006), among other film and television appearances and cameos. He stopped concert touring after 2004, and last performed live at a charity event in 2006. In 2013, Bowie returned from a decade-long recording hiatus with the release of The Next Day. He remained musically active until his death on 10 January 2016, two days after the release of his final album, Blackstar.